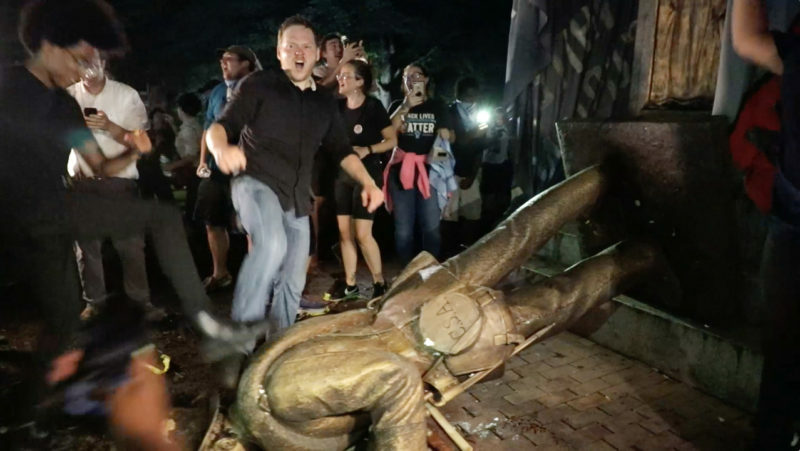 Students toppling "the Silent Sam" Confederate Monument in August on UNC's campus (Herald-Sun). Folks, if you have been thinking about donating to Payday, this week would be a good time to do it. Due to an invoice snafu at the Guardian, my paycheck is late this week putting me in the position of being unexpectedly broke when I had been hoping to have a fun week. So, if you can, donate today. Earlier this week, 79 teaching assistants at the University of North Carolina announced that they were going on strike after the school’s board of trustees voted to reinstall the controversial Confederate monument Silent Sam and construct a $5 million history center on campus in which to place the monument. The group also was protesting the decision of the university to create a $2.2 million “protest platoon” to monitor protests on campus. The group is calling for the administration to sit down and discuss a series of shared grievances over racial injustice on UNC’s campus. The strike by teaching assistants will delay more than 2,000 final grades from being entered. The group’s officials say that they plan to continue in the strike until all of their demands are met. Last week, a group of 250 adjuncts at Elon University filed a petition with the NLRB to hold an election on unionizing with SEIU. If successful, they would be only the second group of adjuncts at a private university in the South to unionize; following the lead of nearby Duke University, which moved to unionize in 2016. Union organizers say that currently, 46% of the classes at Elon are taught either by adjuncts or instructors that will never be eligible to receive tenure-track permanent positions. Over in Charlotte, newly elected Sheriff, Garry McFadden made one of his first acts signing a measure to do away with the city’s cooperation with ICE’s 287g cooperation program. Nationwide, 78 counties participated in the 287g data sharing program with ICE. McFadden hopes that it leads other counties to follow suit. “And so now we have to show Charlotte that this is a step in the right direction and I need everybody’s help [to show] Charlotte and the nation that we are doing the right thing,” said McFadden. This week’s Payday goes out to Manuel Duran, Salvadoran reporter and the founder of Memphis Noticias. In April, Duran was arrested while covering a protest in Memphis. At the time, advocacy groups say that Duran was specifically targeted by police for arrest due to his negative coverage of the local police department. Duran says that he was arrested and pulled out of a group of other journalists covering the March despite the fact that no other journalists were arrested. After being arrested, the local Shelby County Sherrif in a controversial move honored a request to turn over Duran to ICE authorities. This week. after nearly 9 months in ICE study, Duran was able to win his release from ICE custody while he awaits the trial that could determine whether he is deported. Pittsburgh News Guild Launches a New Wave of Militancy. This year, Pittsburgh became the first major city in the United States to stop having a daily printed every day as the Pittsburgh Post-Gazette discontinued printing. Post-Gazette’s management claims that the publication lost $22 million last year and some reporters say they have gone as many as 13 years without any raises. As the once respectable paper continues its death spiral, the Pittsburgh NewsGuild has become increasingly militant towards management with workers engaging in a byline strike there earlier this year and filing multiple unfair labor practices charges against the company. On Tuesday, the Pittsburgh NewsGuild picketed the Post-Gazette owner John Robinson Block’s speech at the Rotary Club at the Omni Sheraton Hotel calling him to agree to a fair union contract after 22 months of contract talks. “This is the beginning of a much more visible presence that we’re going to have, letting the public know of what we’re facing,” Pittsburgh NewsGuild President Michael Fuoco, a reporter at the Post-Gazette, told WESA. Plug news deserts report and put in a growing time of consolidation in Pittsburgh, check out 100 days in Appalachia). Finally, a big congrats this week to Earloonee Woods, the producer of the popular Radiotopia podcast Ear Hustle about life inside the San Quentin Prison had his sentence commuted this week. Woods had served 21 years of his 30-year sentence on robbery charges when he took up podcasting and said he was thrilled by the commutation decision. For more, go to Southerly Magazine. Be the first to comment on "UNC TA’s Strike – Pittsburgh NewsGuild Pickets – Elon Moves to Unionize"